KURTZ-PHELAN: Good evening. Thanks so much to all of you for being here. I am Dan Kurtz-Phelan. I’m the executive editor of Foreign Affairs. I have been at the magazine for about two months, so I can take no credit for the issue that we’re talking about today. (Laughter.) But nor can you blame me for anything at this point, so save your complaints for my colleagues when you see them. It’s a—it’s a great pleasure to have two of our authors from the last issue, the November/December issue which we’re talking about today. The lead package, as all of you know, was “America’s Forgotten Wars.” And we really have two of the kind of best people to talk about this subject, but also two people who are really the platonic ideal of the Foreign Affairs author as far as we—as far as we’re concerned. They have both spent an incredible amount of time working on these issues at a very, very high level. They’ve made decisions in the Situation Room, in the field, and they’ve taken the time to really step back and reflect and analyze these issues in a way that reflects both the authority they have from doing this in the real world, but also the kind of analysis and reflection that they probably did not have time to really do when they were in their jobs. So it’s great to have them here. It’s great to have them in the issue. Both pieces are fantastic. And I really encourage you to read them, along with the rest of the package if you have not already. I don’t want to spend a ton of time going over their bios since you all have them, so we’ll really get straight into the substance. The idea behind the package, “America’s Forgotten Wars,” really grew from the observation that the editors at Foreign Affairs had, which will be obvious to many of you in this room, that, you know, we’ve become so accustomed to being at war, to having American troops abroad, to seeing American servicemembers dying in combat even when we don’t really call it combat, that we’ve really stopped talking about it. It’s just kind of amazing, both in the foreign policy community and in the broader public, how little time we spend talking about interventions abroad, about conflict abroad, even though we have troops deployed all over the world, even though our counterterrorism efforts really have a global reach. And so what we hoped to do with this package was refocus a little bit of attention on how we’ve gotten where we are, what the—what the key questions are now, what the risks are now. And that is what both Emma Sky and Lisa Monaco addressed in their pieces. You know, I want to—you know, starting from that broad observation, I want to ask both of you a very broad question about how we’ve gotten where we are. You know, if we were sitting in this room 15 years ago, say, and one of us had said that 15 years later we would still be talking about conflict in Iraq and the threat against the homeland and our partners from terrorism, I think most people in the audience would have expressed either disbelief or dismay. It would have—it would have been shocking, I think, to imagine that we’d still be really fixated on these issues. So my question to both of you, starting with Emma, is: Why are we still where we are? How have we not made more progress in the conflict in Iraq, in this case? And do you think we will still be as focused on these problems in 15 years as we are now? SKY: Well, when you look back, 2003, the Iraq War was supposed to be a war that would change the Middle East completely. And the architects of the war said Iraq would become a democracy, that would have a domino effect across the region, and it would make peace with Israel. So that’s how the architects saw this war. And you can look back and reflect, and you think, wow, the Iraq War really did change the region. It changed the balance of power in the region in Iran’s favor. It led to the collapse of the state of Iraq. And the weakness in the state of Iraq in how we left Iraq basically enabled Iran to spread its influence across the region. And this has created or exaggerated the power struggle between Saudi on the one hand and Iran on the other, leading them to support extremists in different countries, turning once-local grievances over poor governance into these regional proxy wars. So it ignited something that has had a profound effect on the people who live in Iraq and in the region. So it’s not exactly what people promised. Where do we go from here, or will we still be involved in 15 years from now? It’s a good question, because you think, 15 years, our policies led to the collapse of the state in civil war. But from 2007 to 2009 was really the only time that we actually had the right strategy, the right leadership, and the right resources, and the violence came down. Iraq was on the right track. KURTZ-PHELAN: This is the surge period. SKY: During the surge. Iraq was really seen to be heading in the right direction, and the Iraqis felt and we felt that the bad days were behind. But then, I think, when you look under the Obama administration the rush for the exits, the unwillingness to uphold the election results in 2010 left the guy who had not won the elections in power, Nouri al-Maliki. His policies alienated the Sunnis. He went after the Sunni politicians, accusing them of terrorism. He went after the tribal leaders who, with our support, had defeated al-Qaida in Iraq. And he created the conditions that enabled ISIS to rise up out of the ashes of al-Qaida in Iraq and proclaim itself as a defender of the Sunnis against the Iranian-backed sectarian regime of Nouri al-Maliki. And that’s how ISIS came to take over a third of Iraq. Now it’s a stage where ISIS in Iraq has been defeated, this iteration. And I think there’s a temptation to say, OK, let’s get out again. But ISIS is not the root cause of the problems in Iraq. It’s a symptom of a problem. And the problem really is the bad governance, the poisonous politics. And so, in my article, I argue that the U.S. should remain engaged because when the U.S. withdraws completely the vacuum is filled by Iran. It’s filled by non-state actors. So I argue not for a massive, you know, troop presence, but for this political engagement, the diplomatic engagement to help the Iraqis move forward. They feel much better at the moment with ISIS defeated. They’re heading into elections May 2018. And it’s whether the U.S. can play a role in helping bring the Sunnis and the Kurds to the table to help form a government that is inclusive of all Iraq’s communities. KURTZ-PHELAN: I want to come back to both the politics and the troop levels, but, Lisa, would be curious for your broad sweep of history in your area. MONACO: Well, sure, and thanks for having me. And I have to say it’s maybe the first time I’ve ever heard my name referenced with platonic ideal in the same sentence, in your opening. So thanks for that. I agree with a lot of what Emma has said. You know, from a terrorism perspective, from a counterterrorism perspective, if you kind of reframe the question into kind of how is it that we’re still here 16-plus years after 9/11, and engaged in so many settings to combat terrorist forces and a terrorist phenomenon in the form of ISIS, a lot of what Emma said, I think, applies in the specific area of the terror threat. One is, you know, it is really a function of unaddressed grievances that has, I think, kept us at the sometimes- low, sometimes-high boil when it comes to combating the terror threat. And the instability from lack of governance, lack of security institutions, economic grievances, lack of inclusive governments, all of the things that Emma referenced that are clearly true with respect to Iraq, but you could go across the map to find those same factors contributing to why we are embroiled in so many conflicts around the world, specifically focusing on terrorism issues. And then I think what we have seen is in a lot of these places we have gotten to a point of having what I always found in government and in the counterterrorism space as a bit of a cart-horse problem. In other words, we would find that we could be successful with partners—and I would argue working with partners, particularly abroad as well as—and we can talk about that from the domestic space—but is critical to the—our ability to address the terror threat. But, having an effective partner on the ground, you need all these ingredients. You need inclusive governance, as we saw vis-à-vis Iraq. You need some kind of grounding in security institutions. You need an ability for our forces to operate in partnership, whether it’s train, advise, assist, et cetera. But in the—in the places where we need that most is where we have the most instability, the most ungoverned spaces, the most nascent and not-capable partners. So how do you—how do you kind of square that circle? You need enough security for our folks to operate in a way that is going to help our partners and give them confidence training, the advice, the assistance, et cetera. But the further and the kind of more expanded our presence gets, we have also faced backlash as well. So it is really a very difficult balance to strike. I would argue where we have been focused on making sure that we have a capable partner, where there is inclusive governance, where we are able to focus our efforts with key partners like the Counter Terrorism Service in Iraq, after we ensured that there was some measure of inclusive governance as a precondition for us going back in to address ISIS, that’s where we have seen the most progress. But we have to have those elements in place first: some element of inclusive governance, some willing and capable partner to have us be kind of moving down that path against the terror threat with them. KURTZ-PHELAN: So I want to ask one more backward-looking question before turning to some of the present-day challenges and where we go from here. You know, both of you zeroed in on underlying grievances and lack of governance as kind of the key problems when it comes to both of these threats. You know, one thing that is very striking or one way of reading the history of the last 15 years is that in some ways our efforts to counter direct threats, whether that’s the use of force to address an al-Qaida cell or the war in Iraq in the first place, has actually increased the governance challenges and the underlying grievances in some ways. The article in The New York Times Magazine about airstrikes and civilian casualties was very powerful and disquieting. To what extent have the things that we have done to address threats in the moment made the long-term challenge harder, especially when it comes to the casualties problem? MONACO: Well, you know, I think this is a—kind of a familiar challenge, and one I just alluded to. I think that—and, you know, that New York Times article was very powerful. I think that we can’t—we can’t rely on any one tool to such a degree where we are blind to the second-, third-order effects, but nor can we afford, I would argue, to take that tool off the table. So we’re talking about the use of drones to address terror threats. You know, the Obama administration tried to put a framework in place to ensure that we could address threats to U.S. persons that were imminent that—and where a host government, if you will, or the existing government was either unwilling or unable to address that threat, that the president and his national security team would exercise their—frankly, their solemn duty to protect the United States and to protect U.S. persons abroad and here by taking that action. But putting it within a framework that ensured there was near certainty, the highest standard you can apply, of no civilian casualties and a whole host of other kind of policy and governance pieces around that. We, I think, cannot be in a position where we’re not able to address using a precise tool, but we have to also be transparent and willing to admit where there are mistakes made. Which is why the Obama administration also put in place an executive order that said there would be transparency about civilian casualties, because at the end of the day, if we can’t have that transparency, we’re not going to have the confidence of both people here in this country as well as abroad with our partners about our—what we’re trying to do and why, and how we’re going about it. And that means we won’t have the legitimacy that we will need going forward to continue to use those tools, because I do think we’re going to continue to need to use those tools. SKY: You know, you can look at the time of 9/11. Maybe there were 400 bad guys out there. Our response to 9/11—invasion of two countries, the collapse of two states, the deaths of hundreds of thousands of people—has obviously had an effect on that part of the world. And, you know, we talk about they need to reform their religion, we talk about all of those things, but I don’t think there’s been an honest reflection on how did the number of bad guys go from 400 on 9/11 to tens of thousands. We killed, I don’t know, 40,000 in Syria. How come there’s been a proliferation of people joining these organizations? There was no al-Qaida in Iraq before the invasion of Iraq. We should never have invaded Iraq in the first place. But, you know, we are where we are. When there is a collapsed state, when there is ungoverned spaces, it creates the conditions in which these sorts of organizations can flourish. But we have to understand and we have to look at the way that we have approached the terror threat when it’s a symptom of something rather than the cause of something. And I think we really have to reflect on have we made things worse, or are we making things better? MONACO: Look, Emma’s right, and—since we are where we are, right? And the problem of ungoverned space I think is, you know, one of the—one of the main challenges we face, and it’s absolutely the case that ungoverned space, safe havens, chaotic environments—I mean, look, the veterans of al-Qaida, who, over the course of two administrations, the Bush administration and the Obama administration, and the heroic work, I would argue, of military, intelligence, law enforcement officials, diplomats to actually put in place an ability to address the al-Qaida core threat in Afghanistan and Pakistan. To diminish that threat that attacked us on 9/11, I think we’ve been quite successful. This is the point in the evening when everyone should knock on wood, because you don’t actually occupy my job without, you know, having to do that when you say things like that. But the fact of the matter is because it became an inhospitable place for core al-Qaida and its remnants to operate in Afghanistan and Pakistan, literally we saw the veterans decamp to Syria, and exploit the chaos and the ungoverned space created why? Because of Assad’s brutality against his own people. So the persistence of safe havens and ungoverned spaces and chaotic areas will continue to be exploited by terrorist groups and new and old powers, as we’re seeing. And so I think our efforts to address the terror threat are going to have to include some measure—as I say in the piece I wrote, some measure of pressure on those ungoverned spaces to address the threat to the United States. But we will not get out from under this cycle unless we are addressing those fundamental challenges that create the chaotic and ungoverned space in the first place. And, you know, we can talk, I think, at more length, and maybe we’ll get into it in the questions. That’s not even addressing the digital safe havens that we now have to address vis-à-vis ISIS and its exploitation of social media. KURTZ-PHELAN: Yeah, I’d love to come back to that question before we get into audience Q&A in a few minutes. But, firstly, it’s an opportune moment to focus a bit on Iraq and Syria specifically. Prime Minister Abadi declared victory over the Islamic State, more or less. A few days ago I think Putin was in Syria doing something similar. Whether that’s his right or not who knows, but he made an announcement as well. Lisa, I’d be interested to hear from you how you see the extent to which the U.S. government is currently positioned to address the hybrid threat from both al-Qaida and ISIS at this point, both attempting to infiltrate people into the West but also the lone wolf problem. MONACO: So I think that, you know, ISIS—we should be proud and—of the Iraqi security forces, first and foremost, and our work and the coalition’s work to enable them to take back to the—Mosul and the other areas, right, and to really deny now the vast majority of the—of the physical caliphate that ISIS had taken over. But when I think about the concern and the threat from ISIS, I think about it in three manifestations. ISIS as an insurgent army, which through the work of the coalition and the Iraqi security forces has really been diminished in Iraq and Syria, but that’s only one manifestation. The other—the other two, I would say, are as a terror group—a kind of traditional as we’ve come to know it, terror group to deploy sophisticated fighters, as we saw in Paris and Brussels, et cetera. And then the third—the most concerning, I think—is the manifestation as a social movement or social phenomenon in the way that ISIS has been able to exploit and abuse the great engine of innovation and free speech and expression that the United States gave to the world in terms of the internet. They’ve been able to exploit that and use this, quite ironically, to reject modernity, right, to peddle violent, vicious, and really heinous images, and to recruit young people and mobilize them to violence. So, when it comes to the threat from ISIS, I think on the first—in the first manifestation, you know, we are doing very, very well. But they are going to seek to continue to project power outward in both of the other two manifestations. Now the foreign fighter flow into Iraq and Syria has gone down to a trickle, if you talk to the—to the experts. And those of us who used to be concerned about this massive outflow back into Europe and its environs I think are less concerned about that volume, and much more now concerned about the quality of those individuals and the training that they’ve received. MONACO: So, for instance, just take the European numbers, which obviously are most concerning, both from Western passport holders being an e-ticket away from this country once they make it back to Europe. You know, the numbers are that some 5,000 or so have traveled into Iraq and Syria, and a fair bit—maybe, you know, 2,500—having been killed or staying in place. But I think the European—the EU CT coordinator, counterterrorism coordinator, recently said he’s worried about as many as 2,500 who can flow back and be quite, quite capable. So, look, I think Europe faces a different threat than we do in terms of that foreign-fighter returnee problem. But we should—as I say in my piece, we should not think of our ocean as a perfect buffer. It is not. We have built up, however, I think, a series of structures that enable us to be better-positioned against that threat, but it is—it is not perfect. So I am not, you know, totally sanguine about that threat. But I am much more concerned about the challenge posed by those who are individually kind of radicalized, self-radicalized. You know, we use the term “lone wolf.” When I use it, I always use either actual or air quotes because I don’t like the term “lone wolf.” I think it’s a misnomer. What those of us who have really studied this issue would tell you is there’s no such thing, that individuals who are seeking—who become radicalized, who do so online, are actually seeking a community, right, and they find that in that community online. And the challenge we face is those individuals—people like—now, it’s still early in the investigation, but, you know, like the individual who sought to bomb the subway in New York earlier this week or the West Side Highway attacker, these are the kind of prototype of individual who consumes all manner of this material online and can become mobilized to violence. But they’re not in touch with any of the complex network using the communications apparatus, part of a broader cell—the type of tradecraft, if you will, that we built up, an apparatus post-9/11 to actually identify, and that we’ve been quite good at identifying. But when those—when the individuals like we saw earlier this week or on Halloween in New York, when they don’t actually take any of those steps—whether it’s financing, travel, training, et cetera—then they don’t come into the net that we built post-9/11. So we really need to be thinking about what is the new structure. KURTZ-PHELAN: And how are—can you just say quickly, how are the social media companies doing at addressing this? How dissatisfied are you at this point? MONACO: (Laughs.) How dissatisfied am I? You know, I think they are—have been doing better. There is a lot more to do. And I think with the—what’s interesting is the conversations that we used to have about taking the ISIS content down or addressing the abuse of their platforms in terms of ISIS abusing their platforms, we’re now having or transitioning those discussions in the Russia and kind of advertising context. But the bottom line is they’ve been doing more and I think, importantly, are working to use technology—kind of turn the tables on ISIS when it comes to technology; so using the algorithms that enables them to sell you lots of stuff and pop up lots of ads to your—to your inbox and to your feeds, turning those tables and using those algorithms to identify ISIS content, to identify ISIS accounts, to take those down. So, you know, Twitter, where they weren’t doing anything in the 2014-2015 era, across 2016-2017 took down some 375,000 accounts in just a six-month period. So, you know, making progress. Facebook’s doing a lot with AI in this space. And some really innovative work being done by Google to try and push to those seeking ISIS content what they call the redirect method, other content that would challenge the ISIS messaging. Now, that may concern some of you from a First Amendment perspective, but then let’s have that discussion informed by those who are best able to understand how these platforms get used. KURTZ-PHELAN: Emma, just staying with Iraq before we go to the audience, you know, you warn—very powerfully in your piece warn us against having another “mission accomplished” moment. What will success look like in Iraq over the next couple of years? What politically is crucial? And what role can the U.S. really play in facilitating political solutions and really securing what was ungoverned space under ISIS? SKY: So, when you look at Iraq today, ISIS is—the situation is defeated. The Sunnis provinces or Sunni towns are completely destroyed. When you look at Mosul or you look at Aleppo inside Syria, these used to be the heart of culture, cosmopolitanism, Arab pride if you like. They need to be rebuilt. They need to give people hope and optimism for their future. If not, they will easily fall prey to the next iteration that comes alone, or son of ISIS. The Kurds called a referendum on independence in September. Since calling for that, it was ill-advised, but they have really been pushed back. And you look at the position now of Kurds in Iraq, it’s the weakest it’s been since 2003. They were at their all-time strongest, they made this move, it didn’t play out as they hoped it would play out. So they’re at their weakest. And Iraq is heading into elections. So success for now would be an election in which the Kurds participate, the Sunnis participate, and the government formed post-election includes them. If the government formed post-election is brokered in Iran, like what happened in 2010, if it is brokered between the Iranian-backed Shia Islamists and excludes the other groups, that means Iran’s influence is getting stronger and stronger. That is not success. And so a balanced, inclusive form of government is—will help build up stability inside Iraq, will help it push back on interference from its neighbors. Iraq has got a long way to play out. It’s got years and years and years until it becomes more stable and more stronger. It’s at a crossroads again now. It could head in a direction that builds up stability, builds up a sense of Iraqi identity. Or it could go in a direction which pushes it closer to Iran, create the conditions for the next iteration of ISIS. So it hangs in the balance. And U.S. engagement can help it go one way, and disengagement will almost inevitably lead it to go another way. KURTZ-PHELAN: And does that mean a sustained presence of 5,000 troops? Does it mean a fully empowered State Department? What are the kind of key ingredients of that from a U.S. perspective? SKY: —a secretary of state who is active. It requires these conditions. Troops—you know, what happened before in 2010 was when the U.S. was withdrawing its hard power it withdrew its soft power along with it. Often troop presence is a sign of commitment, not because the troops are out there doing lots and lots of different things. It just keeps U.S. engaged. 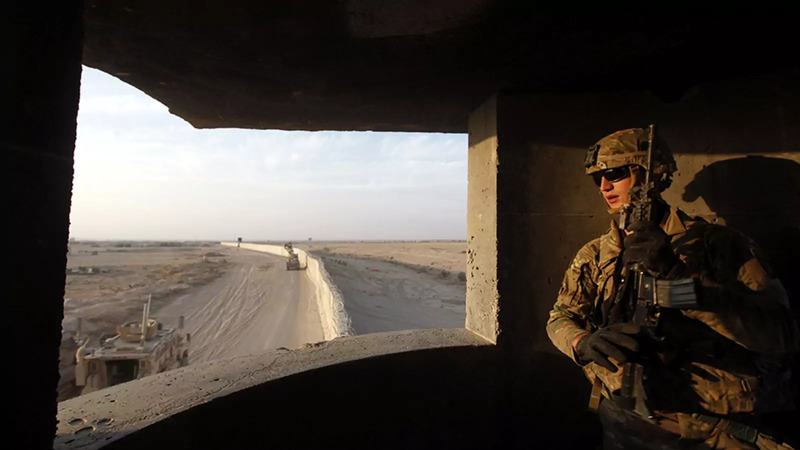 U.S. troops are required to help continue training the counterterrorism inside Iraq, continue with some of the intelligence forces, the ones that have proven themselves in the fight against ISIS. So that is necessary. But the bigger issue is that diplomatic engagement to show that Iraq matters. KURTZ-PHELAN: So a small troop commitment with significant political and diplomatic engagement, would be the right recipe, from your perspective? SKY: An empowered ambassador supported by Washington, supported by the secretary of state. But at the moment, we don’t have a State Department that has that strength, if you like. KURTZ-PHELAN: Thank you. I would like to now invite members to join the conversation with questions. A couple of reminders: This meeting is on the record. So don’t say anything you don’t want on the front page of, say, The Washington Post tomorrow. Also, wait for the microphone and speak directly into it. Please stand, state your name and affiliation, and limit yourself to one question, just so we can get as many as possible over the next half-hour or so. Who wants to go first? There are two on the aisle here which we can start with. Q: Hi. I’m Mona Yacoubian from the U.S. Institute of Peace. My question is for Emma Sky. We’ve talked a lot about ISIS and post-ISIS. Increasingly, the rhetoric and the concern is that as ISIS wanes, the Iranian threat in Iraq is increasing. What would you suggest as the best approach for the United States to take in order to push back against that? SKY: The best approach for the United States is to implement the terms of the strategic framework agreement that the U.S. has with Iraq. And that lays out the framework for political engagement, economic engagement, all that form of support. If the U.S. isn’t there helping, then Iran fills the vacuum. It’s not that Iran is some great, strategic genius. It’s that Iraq is weak, and that vacuum will get filled. But just by being engaged—when you look at—you know, if you’re sitting in Iraq and you look at what America has to offer and you look what Iran has to offer, America has much more to offer. So what America can to do to help rebuild the universities, what the U.S. Institute of Peace can continue to do—it’s done some really good work, local reconciliation work, that’s been really effective. So below the radar. That engagement is critical. And you know, all the tools are there. It’s the willingness to apply that. If you look at the issue at the moment with the Kurds, who’s going to mediate between the Kurds and Baghdad? It was Iran that has helped, if you like, Baghdad push back on the Kurds. It can be America that can help the Kurds get back in the political game. America can help look at Kirkuk, for instance. Could there be a special status for Kirkuk? Where should the border be between Kurdistan and Iraq, not necessarily a hard border but even from an administrative perspective? Should the U.S. be encouraging the U.N. to mediate across those districts, to find out which area relates to Kurdistan, which area relates to a province outside Kurdistan. So all that sort of work, it’s hard work. But when you look at Iraq, this is a country that has been multiethnic, multilingual, multicultural for centuries upon centuries. So the issue facing the country is the governance. And you can look at different places of the world—look at Quebec, where they’ve learned how to have bicultural, bilingual institutions, schools, all of that. What comparative experience from around the world can be brought to help Iraqis determine the sort of governance that would create a more stable, inclusive country? KURTZ-PHELAN: Just behind the first question. Q: Hi. My name is Mike King. I’m with the law offices of Peter C. Hansen here in Washington, D.C.
My question is about foreign fighters returning from, say, Syria, particularly to the West, with expressed desires to, now that they are—have been pushed out of Syria, for example, say Raqqa, to engage in terror attacks in the West. Specifically, I’m thinking of what the BBC reported as the so-called Raqqa exodus earlier this year, where thousands of foreign fighters from Europe, maybe from the United States, elsewhere, were allowed, supposedly, by the U.S. and its allies to exit Raqqa, free of engagement from—you know, from a suppressing military force. I realize there are implications for international human rights, the Law of Armed Conflict, Law of War, et cetera. But I’m wondering if you could deconstruct that event, that strategy, and maybe elaborate on what it portends for current risks, future risks, and maybe what the strategy in future situations like that might—or, a better strategy might be. MONACO: So I’ll start. I didn’t see the specific piece you’re mentioning, but it kind of—in general, obviously, the foreign fighter challenge and, particularly, the outflow back to Europe is a huge—is a huge concern, particularly because I think that our European partners, who have very—some very, very capable intelligence services, very, very capable law enforcement services, they have not undergone the same type of transformation that we did post-9/11 to break down the barriers between law enforcement and intelligence information sharing, which becomes incredibly important when you’re talking about how do you detect and understand when their foreign fighters are coming back through a fairly porous land border and, you know, coming up through Syria, through Turkey, et cetera, and then up through and into Europe, as we saw, with the Paris attacks, et cetera. So certainly the challenge of—you know, the exodus from or the southern fleeing from Raqqa down into southern Syria, and the potential for that to add to the outflow is one that our European partners are very focused on. But, quite frankly, I think we in the United States need to be continuing and underscoring the work that we were doing in the last several years to help our European partners do some of the integration that we learned the hard way, quite frankly, after 9/11. We had to break down legal, structural, cultural walls in our own government to say, you know what, rather than having silos in the law enforcement and intelligence lanes, we need to be working together side-by-side, and not be—not be so kind of hemmed in in our silos. You know, I spent a lot of time talking to my French counterparts, my Belgian and other counterparts. And they really have a mindset that law enforcement and intel still can’t talk to each other after that first response to an incident. And that’s something that we just would never countenance in our post—I would argue, post-post-9/11 world here. So what we ought to be doing, in my view, is continuing the very good work that Jim Clapper started, by convening his intelligence, and law enforcement, and other counterparts in Europe to help them integrate those services. We should not be sending signals to NATO and our NATO allies that we’re not going to support them and be a guarantor of their security. We should not be, as I say in my piece, pulling up the drawbridge when it comes to being a leader in the world and being a leader in the world stage particularly with our European allies, and giving them a sense of doubt about our commitment. Not because of some altruistic sense on their part, because for our own security, when it comes to the—that foreign fighter threat—we need our European partners to be as capable as possible before those folks come here. SKY: I read the report, but I don’t know any details about it. KURTZ-PHELAN: OK. In the front row here. Q: I’m Audrey Kurth Cronin at American University. My question relates mainly to what Lisa Monaco was talking about. I think one way to ensure that wars are forgotten is to make them perpetual. And I wonder about the counterterrorism framework that we’ve been using to talk about the terror threat, which lumps together a lot of different, disparate groups, some of whom go back centuries in their roots and in their grievances. But in a sense, we’ve given them an enemy to align against. I have great admiration for the work that’s been done with our allies, with our partners in building intelligence cooperation, and so on and so forth. So I think we’ve made a lot of progress there. But with respect to this framework, if we’re strictly focusing safe havens, we give the enemy all the initiative. It’s highly militaristic, the way that we respond to whatever happens. There’s a tremendous threat of mission creep. How exactly do we get out of an extremely astrategic perspective in counterterrorism that, by definition, could never end? MONACO: So I guess I would take issue with the notion that—or, maybe I should explain it better, which is to say when I say keeping pressure on safe havens, I don’t mean only in terms of the kinetic. There will be times when, quite frankly, if there’s no other way to disrupt that threat, that I believe that we need to take action to address the threat, if it can’t be addressed in a different way. But when I talk about addressing safe havens, I mean getting at all of those pieces, that cart horse problem I referenced before, right? So, you know, the military piece and the train, advise and assist mission of our forces is only one aspect, right? it is having those security institutions, not just the military intelligence and law enforcement elements but all of the—all of that, that’s knit together to enable a capable partner, who can—who can take action in their own backyard so that we don’t have to be there. But that means bringing all of the players in a particular area, in a particular government together. It is not only a military approach. So, you know, there is a role, and there has to be, in my view, in order to address certain threats to this country. But it—that can’t be the only tool. If it is, I quite agree with you, then we’re perpetuating a cycle that won’t end. KURTZ-PHELAN: Can I ask a follow-up question? Do you worry that the balance is changing in an unhealthy way in this administration, from your perspective in the last administration? MONACO: Well, look, I worry. I think Emma’s absolutely right, that—and I think it’s better to have these conversations not in the general but in specific areas. So Iraq is a perfect example. I quite agree with Emma that the last thing we need to do is declare victory and kind pull up stakes. That would be a horrible result, right? The same is true, quite frankly, and President Obama talked about this in Libya. One of the greatest mistakes, he has—he has said himself, was not planning for the day after the Libya intervention, right? And the list can go on and on. Somalia, right? We spent a lot of time, and effort, and diplomatic—and I see some of my former colleagues who worked on these issues—you know, to have a multinational force, to work with AMISOM, to—you know, to shore up those capabilities. If we don’t continue that very hard work in those areas, you know, we will just be throwing good money after bad. But I do think you have to be focusing on—you know, take a place like Tunisia, one of the greatest sources of foreign fighters into Syria and Iraq, right? Probably the one—and I’ll jinx it now—last glimmer of hope out of the Arab Spring, right? It’s got a constitution. It’s—right? And we have poured effort into building those security services, helping that governance system. If we don’t keep up that work in this administration, you know, Tunisia and Libya and Egypt, that is a cauldron ripe for just continuing down this cycle. So we absolutely have to stay engaged. We need to make partnerships across the security and governance and civil society. Let’s not forget civil society and the role that we should be playing there. You know, I am—I am not hopeful that is the—that’s the posture that we’re taking. We’re seeing signs—you know, President Trump said, you know, Libya—we have no role in Libya. I think nothing could be further from the truth. Not, again, out of some, you know, pie in the sky sense of altruism, but out of our national interest and in our national security interest. Q: Hi. Chris Runyan from USAID. And I had the pleasure of serving alongside Lisa at the NSC, but from the Africa directorate. Just a quick question. I think because it’s wintertime I can use a Wayne Gretzky quote. But skate to where the puck is going to be, not where the puck is. So just curious, looking at emerging markets for extremist—violent extremist activity, pretty worried about Africa and the vulnerability there. And Emma mentioned ungoverned spaces. I’m more concerned about miserably governed spaces, and the kind of divide between state and citizen that we’re seeing in dozens of countries, especially in Africa. And curious if you could talk about that and how you see trends going forward. Thanks. MONACO: You know, I’m sure Emma has other things to offer here. I think you’re absolutely right. And skate to where the puck is is a good analogy. I think the trends are not great, particularly in the areas you mentioned. I would also add Indonesia to that—to that list. And so the question is, do we have a strategy of engagement, of diplomacy, of, you know, really focusing on our role in the world as being a convener, a supporter of multilateral institutions, things like AMISOM, et cetera. And, you know, I haven’t seen that. And, you know, we’ll see—we’ll see what the future brings. But first and foremost, it would be good to have a State Department that is engaged in that work. KURTZ-PHELAN: Emma, given your experience in Afghanistan and Iraq, are you worried about the threats themselves or the U.S. response when you look at the Sahel and sub-Saharan Africa? SKY: (Laughs.) A bit of both. I mean, you know, the default is, oh my goodness, who can we sell weapons to. And that results in us helping governments crush their opposition by sending them weapons without looking at how they govern, and without being aware that by making corrupt governments stronger we can be pushing more groups and more individuals towards insurgency, and making it less likely there will ever be a compromise or political agreement between them. Everywhere you look, you can see power struggles going on in countries which are weak. I think what add to the complexity is we live in the era of the information age. And it’s becoming harder and harder to govern. We see the problem today in the United States. Can you imagine if the United States today had to write a constitution? It would just be impossible. So it’s a very hard era to govern in. Power is diffused. The information era has created that. And so we have enough troubles in the West. And countries which are weak states, they are really, really struggling. And it’s hard. The danger being that we just continue dealing with the symptoms, assassinating people all over the place, without thinking about what are the consequences. Are we building up international norms? When you look at ISIS, with its own drones, how long before those drones are armed drones? So what are we doing to strengthen international norms, international institutions, to try and help build up more credible, legitimate governments? And the danger being we just continue to deal with the symptoms. And you can see the fall out going down to sub-Saharan Africa, the fallout from, you could say, Iraq, Syria, Libya, Egypt. Tunisia is an interesting case. Why has Tunisia proven different to the others? Why Tunisia the greatest hope? And I think there are a number of factors there. It has had politicians who are prepared to compromise. And that is quite rare, when everyone else is playing zero sum. So the Islamists there looked at the experience of Islamists inside Egypt and learned from those experiences. It’s always had a very small military that has not been involved in politics. So Tunisia was never involved in the Arab-Israeli war, so it had no excuse for building up this big military. It’s had a strong civil society. You get women judges. You see the position of women. Under Bourguiba the levels of education, the family planning, all that happened. The closeness to Europe. So I don’t know—when you look at Tunisia’s success, I don’t actually credit the U.S. with much to do with that. There are indigenous factors to it. But, you know, you hope that Tunisia will grow and flourish and become a model. That’s a huge hope. But it shows that things are possible if you’ve got politicians who are willing to compromise. KURTZ-PHELAN: We have time for two or three more questions. You, the front row here. Q: Allan Gerson, AG International Law. Could the panelists address the question of the Israeli-Palestinian conflict, and whether U.S. positions are less likely today to fan the flames of Islamic extremism. MONACO: I think it’s—I think it’s a troubling trend in isolating us. And, you know, I think what you’re seeing—I don’t have much to add on this—but I think what you’re seeing is a continued use for the steps we’ve taken to be added to the ISIS messaging, et cetera, right? It just—it certainly does not help in terms of us trying to counter some of that narrative. KURTZ-PHELAN: If you had been in your old job on the day of the Jerusalem announcement, would you have had a 24-hour workday, rather than your average 20-hour workday? MONACO: I think we would have had a very long workday. And Marcel Lettre, who’s here and served ably as the undersecretary for defense and intelligence, knows that we would have had a very lengthy series of meetings about embassy security around the region because of concerns about, you know, what would be the response, and were we postured to deal with that, so. SKY: Well, as somebody who lived in Jerusalem for a decade, and I can acknowledge my old boss down there, General Kip Ward, who used to be the U.S. coordinator—security coordinator for the Middle East peace process, Jerusalem matters. Jerusalem matters symbolically to a lot of people in the world. And when you look at the situation in the last year or so in the Middle East, you’ve seen things that we never imagined, like the Saudis and the Israelis talking together. They have a common enemy, Iran. They were coming together in ways that we’d never seen. KURTZ-PHELAN: I think we have time for one or two more. Yes. Q: Marcel Lettre, formerly from the Pentagon now at Lockheed Martin corporation. So, Emma and Lisa, first of all, thank you guys for your thought leadership and, most importantly, for your service, trying to actually solve or move some of these problems a little bit more in a positive trend. Question really is just about Afghanistan, which we haven’t really touched on yet. I just wondered if you all could give a sense of how you see the trends over the next couple of years. And are we—have we kind of put the right strategy in place? Or are there some incremental shifts of our strategy that we ought to be thinking about, or something much more fundamental that needs to be thought through. MONACO: I’m actually very interested to hear what Emma has to say on this, given your experience in Iraq. But my reaction to the strategy announcement was that it sounded very, very familiar to a lot of what was going on, and where the Obama administration had come to after a series of, admitted, kind of fits and starts. So I, for one, think that we need to continue to be working kind of hand-in-glove with the Afghans and with the Afghan security forces to build that up. So I actually was pretty—was pretty—was relatively happy with that security announcement that the president made, I guess, now several months ago. SKY: Afghanistan. (Laughter.) I read the Duffle Blog. And the Duffle Blog, it was something like the 16th commander of ISAF says: We’re just turning a corner in Afghanistan. (Laughter.) I don’t think we’ve had an honest—really honest discussion on what are our national interests and how do we achieve them. Are we just there because we’re there, because we don’t know whether to pull out or to stay in or do more or do less? We just continue to do the same thing, a little bit going on and on and on. And I don’t think there’s really been a debate on what would happen if we pull out completely. Or do we need to stay there permanently? And so instead we just talk about troop numbers. Troop numbers is not a strategy. What’s the end state? How come we’ve ended up in this forever war? You know, you think this is the greatest military in the world. It’s the greatest military the world has ever seen. America, probably the greatest empire, or the most benign empire, that there’s been. So why does a great country with the greatest military just keep losing its wars and being forever at war? And it doesn’t really matter. It doesn’t make any difference, really, here. There’s no a cost that’s paid by American society for being forever at war. The cost is paid by the 1 percent who serve. And it’s all volunteer force. They choose that. It’s a genetic force now. It’s sort of sons, fathers, sons, grandsons. It just keeps going on. And granddaughters, now. So for me, it’s symptomatic of America really not knowing where it’s at, at the moment, in the world, what its national interests are and how to uphold them. And these little wars are draining America’s self-belief, its energy. This is a country that’s upheld global order for 70 years. And the world benefited from that. And you think now this era is coming to an end, not because there’s been any better idea, but because America is self-inflicting wounds on itself by this obsession with little wars or this obsession with terrorism. And I think until that bigger discussion and that bigger debate is actually held, we’ll just continue draining ourselves—draining ourselves. And America will then isolate itself from the world, feeling unloved, and I think it will be a sad day for the world. But I see the end of Pax Americana coming, not because of 9/11 but because of our response to 9/11 and obsession with terrorism as part of that response. MONACO: So can I just respond a little bit to that? Which is to say that I think we absolutely should never forget that the burden of these engagements is borne by 1 percent. And we absolutely should be keeping that front of mind. I agree that we are very dangerously close to, you know, losing Pax Americana, right? But I have to take issue with the notion that we have not had debate about what are our interests in Afghanistan, and what does it mean to be there, why are we there, how should we be there. I say that because I know because I participated in hours and hours of those debates. Now, it’s a separate question as to whether we as a country and a public engaged in a discussion with Congress and the branches of government that should be doing that. That is a separate issue. And I suspect Emma and I would have a lot of common ground on that question. But I think it is also possible to have had many very—I don’t know what debates or discussions were had in the Trump administration to arrive at their policy. I do know the amount of very hard work, considered and rigorous thinking went into deciding what are our interests in Afghanistan, what is in the American national security interests, and our broader coalition interests, to continue to have blood and treasure devoted to supporting our men and women in Afghanistan, military intelligence, diplomatic development, et cetera. And that it is possible to have those rigorous discussions and also still end up having what seems like a perpetual force. But it is not after—it’s not without serious reflection on what is in our national interest. KURTZ-PHELAN: With apologies to those with questions remaining, I think that’s a really good note to end on. At Foreign Affairs we hope that the package that these two pieces are part of will go some way to facilitating that discussion. Read these two pieces as well as the other four. And we also have a new issue just out, the January/February issue, which all of you should be getting quite soon.